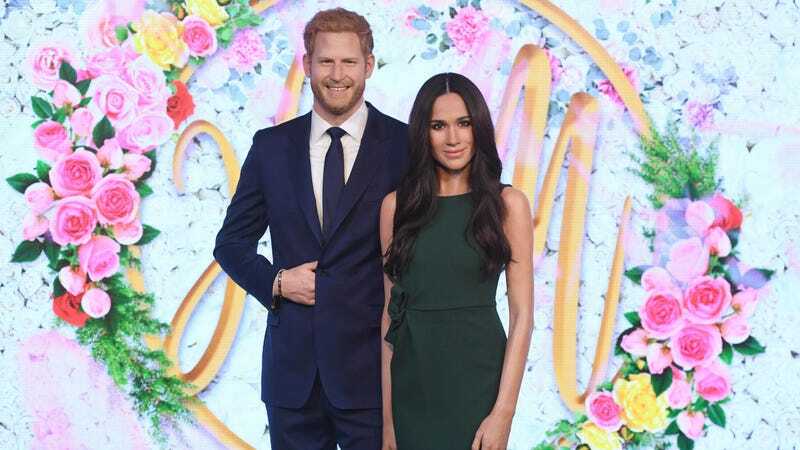 Those of us groveling plebs who won’t be allowed inside the chapel at Windsor on May 19 can now pay our respects to Harry and Meghan in person—sorta—thanks to Madame Tussauds’ London outpost. The happy couple has been parked before a video wall 15 feet wide, so that visitors can choose from different backdrops for selfies. Would you prefer a beach? “We’ve given Meghan an open invitation to come and see the exhibit,” a spokesperson told People. “But I understand that she’s rather busy at the moment.” Looking good, Megs! Not to be outdone, the Madame Tussauds in New York will apparently be unveiling their own Meghan, as well, “to mark the first time a U.S. citizen has joined the royal family in 80 years.” We did it! We finally got somebody in there! I leave you with this modern Old Master painting, beautifully rendered in pixels.